A possibly C12 nave has C13 and C14 detail. Chancel and tower are C14, like the south aisle and chapel, which were rebuilt in the C19. There is a fine brass of 1426. 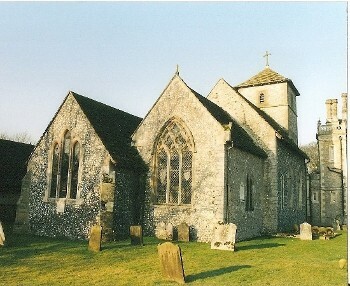 The church stands near the house in parkland beneath Chanctonbury Ring. It is listed in Domesday Book (13, 13) and though the two now stand alone, a probably C17 painting in the house shows the village stood here. The present house dates from 1576, but was transformed in the C19. The original dedication of the church was to St Michael; that to St Mary applied to the south chapel only (2 p47). The proportions of the nave do not look earlier than the C12, though a partly old north lancet and the chamfered jamb of a doorway nearby are C13. The structure of the chancel could be C13 also, but the detail is C14, with a fine three-light east window with reticulated tracery, mostly original, and two trefoil-headed north lancets. The south chapel and aisle, which is narrower, were probably C14, as the proportions of the large pointed opening of the east window depicted on the Sharpe collection drawing (1805) show; this had lost its presumed tracery and had plain mullions and a transom. 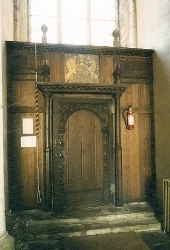 The chapel was the chantry of the de Braose family, lords of the manor from the C11 to the C15. Little of either the chapel or aisle survived the C19 except the spurred bases of the arcade-piers. The small tower, also C14, has diagonal buttresses, single cinquefoiled bell-openings, a low pyramid spire and a west window like the east one. The narrow tower arch has a continuous hollow chamfer on the outer order and an inner one on round shafts with semi-octagonal abaci and bases. Though the interior is largely C19, other C14 remnants include the semi-octagonal responds of the arch from the south chapel into the chancel and some nave roof timbers, including castellated wallplates. 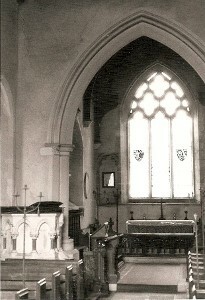 The aisle and possibly the chapel were altered in the C15. The Burrell Collection drawing (1781) shows a two-light square-headed aisle window, consistent with Hussey’s (Supplement) dismissal of the aisle (and chapel) as ‘debased Perp’. The weathered moulded west doorway of the tower, with a square hoodmould, is certainly C15. The chancel was repaired by 1844 (VCH 6(1) p268) and this probably included the south chapel, for the east window visible in the Sharpe drawing had been replaced by what must be the present triplet when it was shown by Adelaide Tracy in 1853 (II p11). In 1862 G M Hills restored the rest (RIBAJ 2 (1895) pp452-53). More money was probably available than was good for him, for the £2000 it is stated to have cost in PP125 is likely to be an underestimate, since the Gorings of Wiston House paid most of it and such private donations were generally excluded. Hills retained only fragments of the old when he rebuilt the aisle and though he was probably not responsible for reconstructing the south chapel, the work was equally thorough. In the nave he inserted two ogee-quatrefoil north windows and replaced the arcade except the bases and the chancel arch, which now has a moulded head. It was probably in the course of Hills’s work that many monuments in the south chapel (see below) were destroyed or taken apart. Benches: (North west corner of nave) Plain, probably C15 or C16. Brass: (South chapel) Sir John de Braose (d1426) A large effigy in full armour, his feet resting on a lion. Instead of a canopy, small scrolls inscribed ‘Jesu’ and ‘Mercy’ are scattered over the field within the marginal inscription. Part of one shield was stolen in 1945 (TMBS 56 (Dec 1946) p158). It is given to Series E of the London workshops (TMBS 15 p242). Font: C12 square arcaded marble bowl on a C19 stem and base. The underside of the bowl shows that as was usual there were originally corner-shafts and, doubtless, a central stem. 1. (East window) Two C14 shields of the arms of de Braose, impaled respectively with those of Clifford and Howard (2 p47). 2. (South chapel, second window) Clayton and Bell, c1878, but possibly altered. (www.stainedglassrecords.org retrieved 29/3/2013). 3. (South aisle, second window) Kempe and Co, two single lights, 1930-32. 4. (North chancel) Kempe and Co. Undated, but according to Collins made in 1909. 1. (North wall of chapel) Probably C15, though altered. Recess with an elliptical head and an ogee-headed gable for an effigy of a child, possibly a son of Sir John de Braose (Mosse p167). 2. (South wall of chapel) Sir Richard Shirley (d1540). Fragmentary. His armoured effigy stands between two kneeling wives. They are surrounded by scrolls on which there were texts or prayers. The front of the surround, with shields in quatrefoils, remains. The style is said to have combined gothic and renaissance (3 p13). 3. (Chapel – sill of south window) Sir Thomas Shirley (d1612) Two kneeling figures survive. 4. (Chapel) Sarah Goring (d1797) It is of E Coade‘s stone, with a draped sorrowing female figure in an elaborate gothick surround (A Kelly p192). 5. Charles Goring (d1829) A draped sarcophagus by Sir F Chantrey, which was erected in 1836 (M Baker p306). 6. Frances Goring (1830?) by J Theakston (Roscoe p1234). Niche: (North of east window) Very restored cinquefoiled head, of C14 appearance. Piscina: (Chancel) Renewed C14 ogee head. Royal Arms: See under screen. Screen: (Now in tower) Parts are included in the doorcase, including the date 1635 and finials. This also incorporates the painted Royal Arms, dated 1795.